Ale'ta and Allan seeks to share the importance of covenant, love and fellowship. On March 16, “Splash Double” won a pack of our Conversation Starters at our March Madness Party. Our Conversation Starters are geared toward engaged and married couples. It is our hope that each card fosters growth and sparks great conversations! Couples receive 15 conversation starters along with an engagement activity or words of wisdom. Additionally, there is an instructional card that encourages couples to pray together before beginning the Conversation Starters. We are overjoyed to present our first product with others! Each pack is $10 and available for ordering online through Square or in person. Shipping is available via Priority Mail for all domestic U.S. customers. We encourage our customers to email their testimonials to us at info(a) aletaandallan.com. 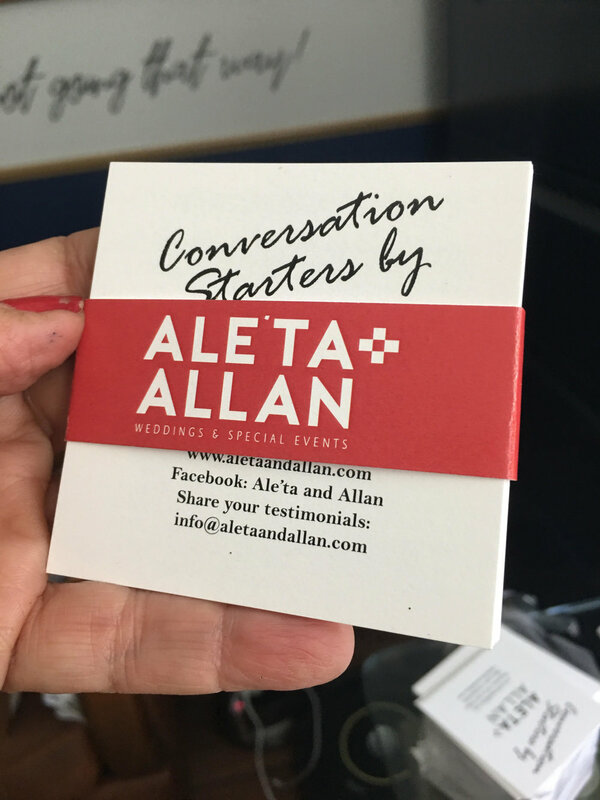 Conversation Starters were designed by Ale’ta and Allan and printed by Sandy Weber of Key 3 Creative.